387 Marlborough is located on the north side of Marlborough, between Hereford and Massachusetts Avenue, with 385 Marlborough to the east and 389 Marlborough to the west. 387 Marlborough was designed by architect Obed F. Smith and built in 1880-1881 by Vinal & Dodge, masons, and G. & E. Stewart, carpenters, for building contractor George Wheatland, Jr., for speculative sale. It was one of six contiguous houses (381-383-385-387-389-391 Marlborough) built at the same time and one of twelve contiguous houses (369-371-373-375-377-379-381-383-385-387-389-391 Marlborough) built for George Wheatland, Jr., in 1879-1881. He is shown as the owner of 381-391 Marlborough on the original building permit application for the six houses, dated November 11, 1880 (one application for six houses). 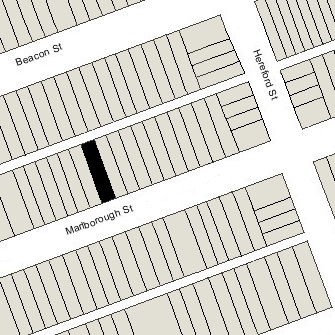 Click here for an index to the deeds for 387 Marlborough, and click here for further information on the land on the north side of Marlborough between Hereford and Massachusetts Avenue. On April 21, 1882, 387 Marlborough was purchased from George Wheatland, Sr., by Henry Martyn Dexter. He and his wife, Emeline (Palmer) Dexter lived in New Bedford, and he purchased the property to be the home of their son and daughter-in-law, Henry Morton (called Morton) Dexter and Emily Loud (Sanford) Dexter, who had married in June of 1881. By the 1882-1883 winter season, Morton and Emily Dexter had made 387 Marlborough their home. They previously had lived at the Hotel Brunswick (southeast corner of Clarendon and Boylston). An ordained Congregational minister, he was editor of The Congregationalist and an historian. On February 15, 1886, Henry Martyn Dexter transferred 387 Marlborough to his son. During the 1895-1896 winter season, the Dexters were living elsewhere and 387 Marlborough was the home of Emily (Sanford) Dexter’s parents, John Eliot Sanford and Emily Jane (White) Sanford. They previously had lived at 292 Marlborough. Their primary residence was in Taunton. John Sanford was an attorney and former member of the State Senate and State House of Representative, having served as Speaker of the House in the early 1870s. From 1882 to 1892, he was Chairman of the State Harbor and Land Commission, and from 1892 to 1899 he was Chairman of the State Railroad Commission. The Dexters resumed living at 387 Marlborough during the 1896-1897 winter season, and continued to live there through the 1902-1903 season. During the next four seasons, they were living elsewhere and 387 Marlborough was the home of Dr. George Strong Derby, and ophthalmologist (and later Ophthalmic Chief at the Massachusetts Eye and Ear Infirmary), and his wife, Mary Brewster (Brown) Derby. He also maintained his medical office there. They had married in August of 1901, after which they had lived in New York City. They continued to live (and he to maintain his office) at 387 Marlborough until about 1907, when they moved to 7 Hereford. 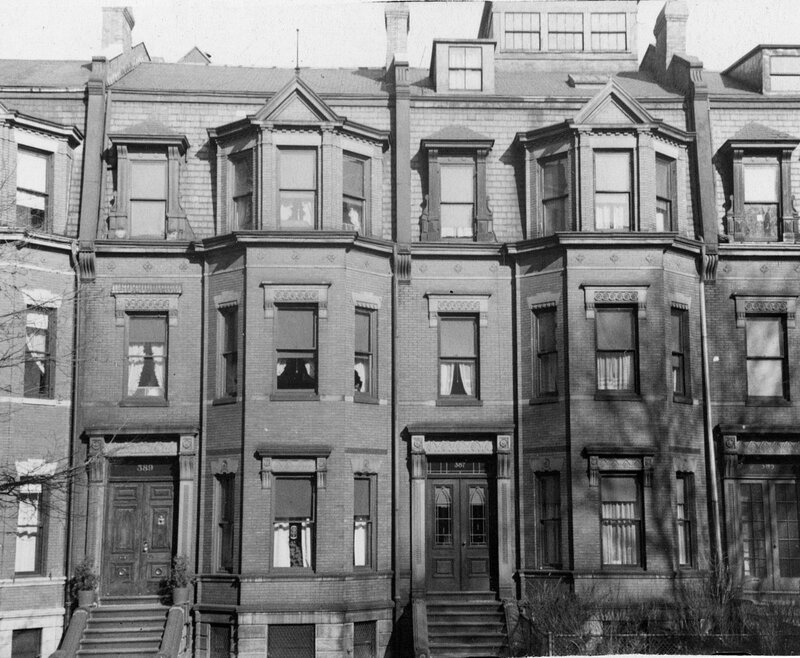 By the 1907-1908 winter season, Morton and Emily Dexter were living at 387 Marlborough once again. Morton Dexter died in October of 1910. Emily Dexter continued to live at 387 Marlborough. Emily Dexter spent the 1924-1925 winter season at the Copley Plaza Hotel and 387 Marlborough was the home of her unmarried sister, Katherine (Kate) Irving Sanford. She previously had lived at 130 Marlborough. She also maintained a home in Taunton. By 1925, she had moved to 353 Beacon. Emily Dexter continued to live at 387 Marlborough during the 1929-1930 winter season, after which she moved to the Copley Plaza Hotel. She died in May of 1933. 387 Marlborough was not listed in the 1931-1934 Blue Books. On August 13, 1934, 387 Marlborough was purchased from Emily Dexter’s estate by Edward F. Cassell, a real estate broker. He and his wife, Agnes Gertrude (Lynch) Cassell, made it their home. They previously had lived at 857 Beacon. In March of 1951, he applied for (and subsequently received) permission to make interior alterations. The house continued to be a single-family dwelling. Agnes Cassell died in May of 1959. Edward Cassell continued to live at 387 Marlborough in 1960, but moved thereafter. On May 15, 1960, 387 Marlborough was acquired from Edward Cassell by real estate dealers Stuart H. Hastings and Joseph A. Gautreau. In July of 1960, they applied for (and subsequently received) permission to convert the property into ten apartments. In their application, they stated that the previous use had been as a lodging house (based on the Lists of Residents, this appears not to have been correct). The property changed hands and on November 23, 1982, was purchased by Elisabeth S. Evans, trustee of the Cove Realty Trust. On February 23, 1983, she transferred the property to E. I. Inc., of which she was the president and treasurer. 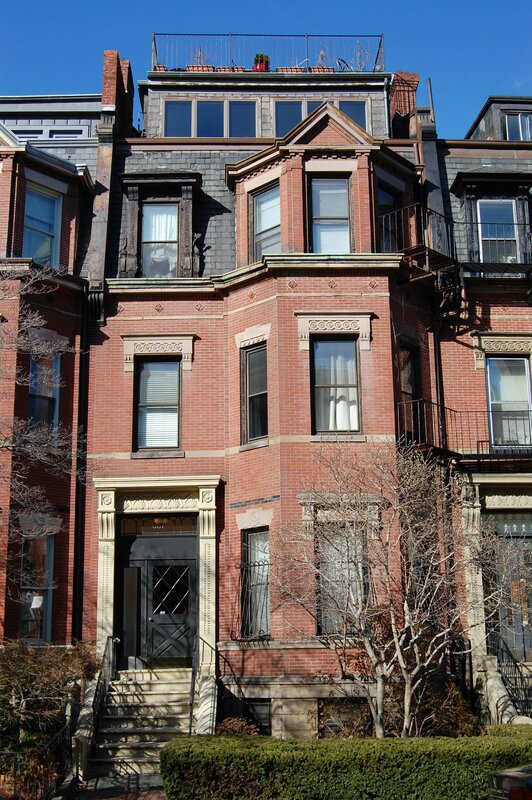 On December 6, 1983, E. I. Inc. converted the property into ten condominium units, the 387 Marlborough Street Condominium.